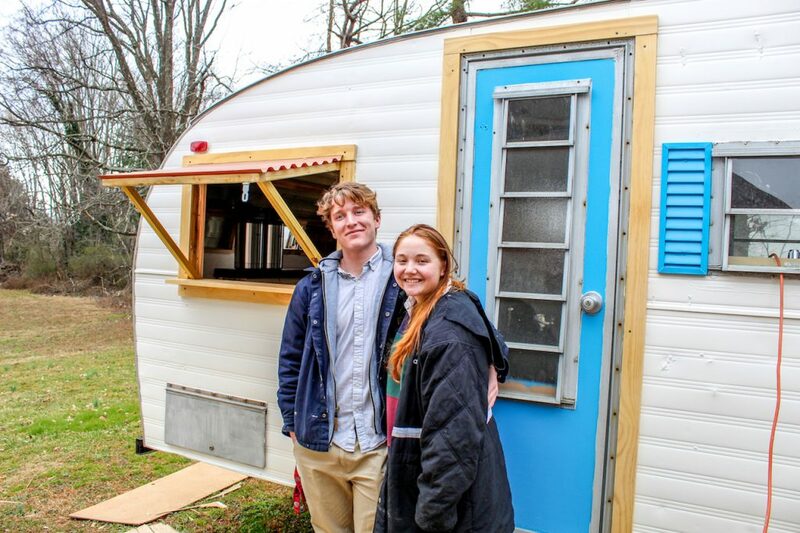 A new mobile coffee shop, Bouncing Bean Coffee, will seek to serve the Lynchburg community in a unique way. The Bouncing Bean is not just any coffee shop. Once a month, it will do business a little differently than usual. Owner Andrew Robinson said once a month, the Bouncing Bean will go downtown and let customers get coffee without having to pay. PRODUCTIVE — King, right, has been working alongside Robinson, left, to get the trailer ready to open. Bailey King, co-founder of the Bouncing Bean and Robinson’s girlfriend, said she hopes they can bring together more community in Christ through the Bouncing Bean. “Our vision is not only to serve people the best coffee ever — or at least try, there’s some tough competition — but also to serve people in the community through our business,” King said. Robinson said during the rest of the month, he hopes to love Lynchburg by showing the same love to people whether or not they can pay. The Bouncing Bean will do this by operating on a “sticky note system,” which will allow customers to discreetly pay for someone else’s order. When a customer is paying for their order, the cashier will ask them if they would also like to pay for someone else’s order. If so, they will receive a sticky note in the shape of a coffee, sandwich or other meal item. The sticky notes will go on a wall near the counter. When a customer who cannot afford an item visits the coffee shop, he or she can subtly use one of the sticky notes to pay for their order. The Bouncing Bean will at first sell coffee, espresso and smoothies. But Robinson hopes to add baked goods and breakfast foods, once he finds a place to bake. 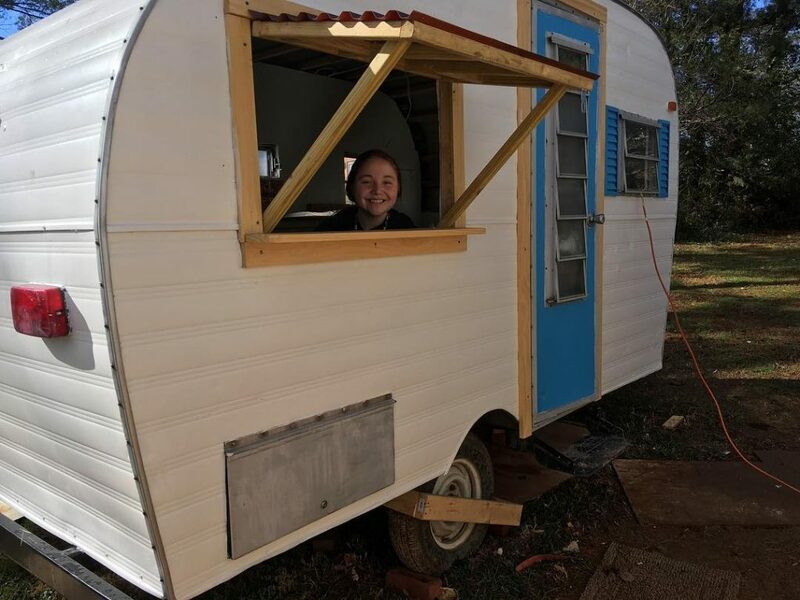 While the Bouncing Bean is not yet open, Robinson is building the shop in a 1966 Arrow camper trailer. He said one of the hardest challenges so far has been squeezing the health code requirements into the 6-by-10 space. As the trailer will be self-sufficient, Robinson has also had to build the electrical system from scratch to hook into a generator. The trailer’s water supply will be stored in a tank. COFFEE — The Bouncing Bean will be in a 1966 Arrow camper trailer. During his time working on the trailer, Robinson has also continued his full-time job as a manager at Panera Bread. Despite the challenges, Robinson said the process has been rewarding. Robinson, a Lynchburg native, had not originally planned to open a coffee trailer. Growing up, he wanted to eventually become a contractor. He hoped to marry and someday build a house. But that all changed during Robinson’s senior year of high school. Although Robinson had attended church his entire life and been involved in different ministries, he explained that working at Panera opened more doors to reach people than ever before in his life. “I want to do this because I truly believe that if Jesus was here on earth today, he wouldn’t be hanging out in church, he would (be) in coffee shops,” Robinson said. King said she and Robinson have dreamed of starting a café in a larger city to help orphans and the homeless. However, Robinson explained he does not currently have the funds. This led to their decision to create the Bouncing Bean. “I know God will provide when it is time, so right now, I’m doing what I can to love the people here, and I think the Bean is a great way,” Robinson said. More information about the Bouncing Bean can be found on its Facebook page, @thebouncingbeanva, or its website, at https://bouncingbeanva.com/. Wonderful mission!!! Love the concept of showing Christ’s love to all.